James Gulliver Hancock's cheerful print celebrates the lush landscape of the Sunshine State. Whether you're partial to the college-town of Tallahassee, the whimsical attractions in Orlando, or the hot Miami nightlife, you'll find a bit of all your favorite parts of the Sunshine State in James' cheerful print. 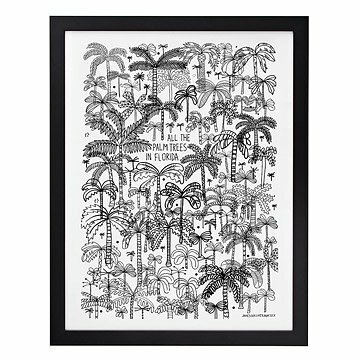 James illustrates a forest of big, small, lush, and lean palm trees—one of Florida's most omnipresent icons—in order to personify this long and incredibly diverse southerly state. A fun art piece to relive a vacation or to remember your past or current home, this hand-pulled one-color silkscreen print brings the spirit of this sun-drenched state to your very own home. RFK Rives paper. Handmade in Brooklyn. Picture will be displayed on the wall and hopefully invoke a smile each time we see.